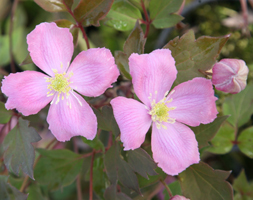 Fragrant, deep pink flowers with distinctive yellow centres in May and June and bronze-tinted foliage. This vigorous, early flowering clematis produces a mass of flowers up to 9cm (3&#189;in) across. Ideal for a north- facing site, it&apos;s best planted close to an entrance or path where the exquisite almond-scented flowers can be appreciated.